In order to deal both with content written according to Web standards and with content written according to legacy practices that were prevalent in the late 1990s, today’s Web browsers implement various engine modes. This document explains what those modes are and how they are triggered. This document covers mode switching as it applies to Firefox and other Gecko-based browsers, Safari, Chrome and other WebKit-based browsers, Opera, Konqueror, Internet Explorer for Mac, Internet Explorer for Windows (including Windows Phone) and browsers that embed IE. Instead of referring to the names of browser engines, the names of the best-known browsers using each engine are used instead. This document focuses on the mode selection mechanism and does not document the exact behaviors of each mode. The purpose of this document is to give you information on how to avoid the legacy modes. The purpose of this document is not to facilitate cherry-picking behaviors by deliberately choosing legacy modes. The choice of the mode for text/html content depends on doctype sniffing (discussed later in this document). In IE8 and later, the mode also depends on other factors. However, by default even in IE8 and later, the mode depends on the doctype for non-intranet sites that are not on a blacklist supplied by Microsoft. Additionally, there are other factors involved even with IE6 and IE7 if Google Chrome Frame has been installed. In the Quirks mode the browsers violate contemporary Web format specifications in order to avoid “breaking” pages authored according to practices that were prevalent in the late 1990s. Previously, different browsers implemented different quirks. In particular, in Internet Explorer 6, 7, 8 and 9, the Quirks mode is effectively frozen IE 5.5, while in other browsers the Quirks mode has been a handful of deviations from the Almost Standards mode. Recently, browsers have been converging on common behavior in their Quirks modes. Most notably, the primary Quirks mode of IE10 is no longer an imitation of IE 5.5 but seeks to be interoperable with Quirks modes of other browsers. The interoperable quirks are being standardized at the WHATWG. The primary Quirks mode of IE10 that is like the Quirks modes of other browsers is sometimes referred to as the “interoperable Quirks mode” to distinguish it from the IE 5.5-imitating “Internet Explorer 5 Quirks” mode that IE10 also has. If you are authoring new page, don’t use the Quirks mode. Just don’t. Use the Standards mode. In the Standards mode the browsers try to give documents the specification-wise correct treatment to the extent implemented in a particular browser. Since different browsers are at different stages of compliance, the Standards mode isn’t a single target, either. The HTML specification calls this mode the “no quirks mode”. Firefox, Safari, Chrome, Opera (since 7.5), IE8, IE9 and IE10 also have a mode known as “the Almost Standards mode”, which implements the vertical sizing of table cells traditionally and not according to the CSS2 specification. Mac IE 5, Windows IE 6 and 7, Opera prior to 7.5 and Konqueror did not need an Almost Standards mode, because they didn’t implement the vertical sizing of table cells according to the CSS2 specification in their respective Standards modes anyway. In fact, their Standards modes are closer to the Almost Standards mode than to the Standards mode of newer browsers. In retrospect, the Web would have been better off by not having the distintion between Standards and Almost Standards, having the Almost Standards behavior as the default and having a CSS property for opting into the behavior that is the default in the Standards mode. Still, you should use the Standards mode—not the Almost Standard mode. The HTML specification calls this mode the “limited quirks mode”. In Firefox, Safari, Chrome, Opera and IE9, the application/xhtml+xml HTTP Content-Type (not a meta element nor a doctype!) triggers the XML mode. In the XML mode, these browsers give the specification-wise correct treatment for XML documents to the extent implemented in a particular browser. IE 6, 7 and 8 did not support application/xhtml+xml. Neither did Mac IE 5. I have not tested the default browser on Symbian3. I have not tested Konqueror sufficiently to say what exactly happens in that browser. The following are additional IE-specific modes that are not specified by HTML5 and that other browsers don’t have. Their activation involves configuration or X-UA-Compatible as an HTTP header or a meta element (discussed below). In addition to the interoperable Quirks mode, IE10 also has a mode called “Internet Explorer 5 Quirks”, which imitates IE 5.5 and is the mode that was known as the Quirks mode in IE6, IE7, IE8 and IE9. IE8, IE9 and IE10 have a mode that imitates the mode that was the Standards mode in IE7. IE9 and IE10 have a mode that imitates the mode that was the Standards mode in IE8. IE9 and IE10 have a mode that imitates the mode that was the Almost Standards mode in IE8. In the developer tool user interface, this mode is not distinguished from “Internet Explorer 8 Standards”. IE10 has a mode that imitates the mode that was the Standards mode in IE9. IE10 has a mode that imitates the mode that was the Almost Standards mode in IE9. In the developer tool user interface, this mode is not distinguished from “Internet Explorer 9 Standards”. IE10 has a mode that imitates the mode that was the XML mode in IE9. In the developer tool user interface, this mode is not distinguished from “Internet Explorer 9 Standards”. It is worth noting that the imitations of the previous versions of IE are not perfect. Random examples that I have encountered myself include IE7 Standards emulation in a later IE version handling @font-face-liked EOT fonts differently and the IE9 modes of IE10 supporting CSS 2D Transformations without the -ms- when the real IE9 requires the prefix. If you follow the advice given in this document, you won’t be targeting these modes, so the imperfections of the imitations won’t matter to you in production. However, the takeaway for testing is that you’ll be better off testing your site in actual old versions of IE running in a bunch of virtual machines than using the developer tools newer IE versions to make the new version emulate an old version for testing. IE10 for Windows Phone 8 has all these modes, too—just like IE10 on desktop. The following are additional modes available in IE6, IE7, IE8 and IE9 (but not in IE10 on Windows 8 or on Windows 7 as of February 2013) when Google Chrome Frame has been installed. This mode is the same as the Quirks mode in Google Chrome. This mode is the same as the Standards mode in Google Chrome. This mode is the same as the Almost Standards mode in Google Chrome. Some engines have modes that are not relevant to Web content. These modes are only mentioned here for completeness. Opera has a WML 2.0 mode. WebKit on Mac OS X 10.5 had a special mode for legacy Dashboard widgets (perhaps this mode remains in newer versions—I have not investigated). WebKit also has hacks for applications that embed WebKit on Mac OS X. Except in IE, the modes for text/html mainly affect CSS layout and the style system. For example, not inheriting styles into tables is a quirk. In old versions of IE and Opera, the box model changes to the IE 5.5 box model in the Quirks mode. This document does not enumerate all the layout quirks. For a list, please refer to Mozilla’s documentation and the Quirks Mode specification. In the Almost Standards mode (in browsers that have one and all the current ones do), the height of table cells containing only images is computed differently compared to the Standards mode. In the XML mode, selectors have different case-sensitivity behavior. Furthermore, special rules for the HTML body element do not apply in older versions of browsers that do not implement the more recent adjustments to the CSS specifications. There are also some quirks that affect HTML and CSS parsing and would cause conforming pages to be misparsed. These quirks are toggled on and off with quirky layout. However, it is important to realize that the Quirks mode vs. Standards mode is predominantly about CSS layout and CSS parsing—not HTML parsing. In browsers that have an HTML5-compliant HTML parser, there is exactly one HTML parsing quirk. Another common misconception is related to XHTML parsing. It is often thought using an XHTML doctype gains different parsing. It does not. XHTML documents served as text/html are parsed using the same parser that is used for HTML. As far as browsers are concerned, XHTML served as text/html is just “tag soup with croutons” (an extra slash here and there). Only documents served using an XML content type (e.g. application/xhtml+xml or application/xml) trigger the XML mode for parsing in which case the parser is totally different from the HTML parser. Although the Quirks mode is primarily about CSS, there are some scripting quirks as well. Until Firefox 14, the HTML id attribute didn’t establish object references from the global scripting scope in the Standards and Almost Standards modes. In Firefox, document.all is partially available in the Quirks mode but not in the other modes. The effects on scripting are more dramatic in IE when falling into a mode that emulates an old version of IE. In the XML mode, some DOM APIs behave differently, because the DOM API behavior for XML is defined to be incompatible with the HTML behavior. With hindsight, this is quite unfortunate. Neither the HTML 4.01 specification nor ISO 8879 (SGML) says anything about using the document type declaration as an engine mode switch. Doctype sniffing is based on the observation that at the time doctype sniffing was devised the vast majority of quirky documents either didn’t have a document type declaration or they referenced an old DTD. HTML5 acknowledges this reality and defines the doctype in text/html as a mode switch only. A typical pre-HTML5 document type declaration contains (separated by white space) the string “<!DOCTYPE”, the generic identifier of the root element (“html”), the string “PUBLIC”, a public identifier of a DTD in quotes, possibly a system identifier (an URL) of the same DTD and the character “>”. HTML5 simplies the doctype to “<!DOCTYPE html>”. The document type declaration is placed in the document before the start tag of the root element. This is what you should use. With this doctype, you can validate new features such as <video>, <canvas> and ARIA. Please be sure to test your page in the latest versions of the top browsers. This doctype also triggers the Standards mode, but lets you stick to less precise legacy validation that doesn’t know about new features in case your organization has silly policies that require targeting legacy validation. But you really should be using <!DOCTYPE html> and get the policies of your organization revised. This gives you the Almost Standards mode. Please note that your layouts based on sliced images in tables are likely to break if you later move to HTML5 (and, hence, the full Standards mode), so it’s better to make your designs Standards mode-compatible right now. Please don’t do this. Willfully designing for the Quirks mode will come and haunt you, your coworkers or your successors in the future. If you frustrated by the differences between old IE versions and still need to support them due to client requirements, it is better to apply specific hacks for legacy versions using conditional comments than seek commonality in the Quirks mode. I am not recommending any of the XHTML doctypes, because serving XHTML as text/html is considered harmful. If you choose to use an XHTML doctype anyway, please note that the XML declaration makes IE 6 (but not IE 7!) trigger the Quirks mode. For the points other than the two X-UA-Compatible cases, IE8 and IE9 perform doctype sniffing like IE7. The IE7 emulation is called Compatibility View. Unfortunately, without an X-UA-Compatible HTTP header or meta tag, IE8 and IE9 let the user accidentally drop your page from their most standards mode to the IE7 mode that emulates the standards mode of IE7 even if you used a proper doctype. Worse, an intranet admin may do this. Also, Microsoft may have blacklisted the entire domain you use (e.g. mit.edu!). You don’t need to include an X-UA-Compatible HTTP header or meta tag. Then fix your site not to rely on non-standard IE7 behaviors and migrate to IE=Edge. Then fix your site not to rely on non-standard IE8 behaviors and migrate to IE=Edge. Google Chrome Frame is a combination of a browser extension and browser plug-in for IE 6, 7, 8 and 9 that adds the engine of Google Chrome into the user interface shell of IE using the networking stack that IE uses. After installation, IE behaves normally by default. However, Web pages can opt to invoke the engine of Chrome instead of the engine of IE using an X-UA-Compatible HTTP header or meta tag. Specifying chrome=1 in X-UA-Compatible invokes Chrome Frame in any supported version of IE if Chrome Frame is installed. Specifying chrome=IE6 activates Chrome Frame in IE6 only, specifying chrome=IE7 activates Chrome Frame only in IE7 and IE6, and chrome=IE8 activates Chrome Frame only in IE8 and lower. The directive for activating Chrome Frame can be combined with the directives for controlling the engine of IE (in case Chrome Frame is not installed) by separating them with a comma or a semicolon: <meta http-equiv="X-UA-Compatible" content="IE=Edge,chrome=IE8">. Once the Chrome Frame has been activated for a page, one of the four modes (Standards, Almost Standards, Quirks and XML) of Chrome is chosen as in normal Chrome. Chrome Frame lacks IE’s accessibility support. When Chrome Frame is activated, the content area in IE becomes an accessibility black hole. That is, screen readers and Windows Speech Recognition don’t work with Chrome Frame. Making your site tell users that they should install Chrome Frame perpetuates the security anti-pattern of sites telling users that they should let someone install a privileged native-code plug-in on their computer in order to use a site. Please don’t bring doctype sniffing to XML. Doctype sniffing is a tag soup solution to a tag soup problem. Doctype sniffing was devised after the HTML 4 and CSS2 specs had been written as a heuristic way to distinguish legacy documents from documents whose authors might expect conforming behavior. Sometimes it is suggested that doctype sniffing be used on the XML side as well for dispatching to different handlers, for recognizing the vocabulary in use, or for activating features. This is a bad idea. Dispatching and vocabulary recognition should be based on namespaces and feature activation should be based on explicit processing instructions or elements. The whole concept of well-formedness was introduced to allow DTDless parsing of XML and, by extension, doctypeless documents. In formal terms, if two XML documents have the same canonical form and an app treats them differently (and the difference is not due to opting not to process external entities), chances are the app is broken. In practical terms, if two XML documents cause the same content to be reported (qnames ignored) to SAX2 ContentHandler and an app treats the documents differently, chances are the app is broken. Considering that as a Web author you cannot trust that everyone parsing your pages uses an XML processor that resolves external entities (even if some browsers appear to do so because they map certain public ids to an abridged DTD for entity definitions), inserting a doctype in XML intended for the Web is mostly pointless and often done out of a cargo cultish habit. (You can still validate against a DTD using the DTD override feature of the W3C Validator, although the W3C Validator will say that the result is only tentatively valid. Or better yet, you can use RELAX NG validation, which does not pollute the document with schema references.) Requiring a doctype only for sniffing would be silly, even though that is the situation with HTML in practice. Moreover, when a lower-level spec defines two things that are equivalent, a higher-level spec should not try to give different meanings to the two things. Consider <!DOCTYPE html PUBLIC "-//W3C//DTD XHTML 1.0 Strict//EN" "http://www.w3.org/TR/xhtml1/DTD/xhtml1-strict.dtd">. If the public identifier is removed, the same DTD is still designated and, therefore, the doctype <!DOCTYPE html SYSTEM "http://www.w3.org/TR/xhtml1/DTD/xhtml1-strict.dtd"> means the same as the previous doctype. Should they be sniffed differently? The idea can be carried further. Suppose the DTD is copied to example.com and named foobar.dtd: <!DOCTYPE html SYSTEM "http://example.com/foobar.dtd">. How could that one be sniffed? The meaning is the same. The whole DTD could even be pasted inline! To put it another way, if you have #include "foo.h", you should not bind any black magic to the name foo.h, because it should be permissible to paste the contents of foo.h inline or copy the contents of foo.h to bar.h and say #include "bar.h". The reason I don’t bother making the same argument with HTML and SGML is that Web browsers don’t use real SGML parsers for parsing HTML, so I don’t think it is useful to pretend that SGML is being dealt with. However, if you are not convinced yet, please see W. Eliot Kimber’s comp.text.sgml post about the matter. In the following table, Quirks Mode, Standards Mode and Almost Standards Mode are denoted by Q, S and A, respectively. When a browser only has two modes, the Standards Mode is marked as “S”, if the line height in table cells works as in Mozilla’s Standards Mode, and as “A”, if the line height in table cells works as in Mozilla’s Almost Standards Mode. Please note that XHTML served using an XML content type is rendered in the XML mode. The purpose of this table is not to suggest that all the doctypes listed in the table are reasonable choices for new pages. The purpose of this table is to show what data I am basing my recommendations on. <!DOCTYPE html SYSTEM "about:legacy-compat"> ? ? ? ? ? ? ? ? Mozilla’s doctype sniffing code has changed substantially in October 2000, in September 2001 and in June 2002. This document describes the situation with Mozilla builds made available at ftp.mozilla.org on 2000-10-19 and later (and with Netscape 6.x). This document does not address the way doctype sniffing worked in Mozilla M18 (and Netscape 6.0 PR3). Safari’s doctype sniffing code has also changed substantially since the first public beta. This document does not cover the behavior of versions earlier than v73 aka. 0.9. Konqueror’s doctype sniffing code prior to version 3.5 appears to come from a very early version of Safari. Konqueror now matches Safari whose doctype sniffing code comes from Mozilla. As can be seen from the table, Opera’s doctype sniffing has gradually moved from being IE-like to towards being Mozilla-like, although Opera 9.5 and 9.6 regressed on the way. At the same time, the layout behavior of Opera’s Quirks mode has shifted from imitating the Quirks mode of IE 6 towards the Quirks mode of Mozilla. Start: Go to “X-UA-Compatible meta?”. IE=EmulateIE7: Go to “Quirky or No Doctype? (Compatibility Mode)”. IE=IE8 or IE=IE7 or IE=a or IE=EmulateIE8 or absent or has script first: Go to “X-UA-Compatible HTTP Header?”. IE=8 or IE=Edge or IE=99 or IE=9.9: Go to “Almost Standards Doctype?”. IE=5: Use Quirks (IE 5.5). IE=IE8 or IE=IE7 or IE=a or IE=EmulateIE8 or absent: Go to “Display All Web Sites… Pref Set?”. Yes: Use Quirks (IE 5.5). Display All Web Sites… Pref Set? Yes: Go to “Quirky or No Doctype? (Compatibility Mode)”. No: Go to “Display Intranet Sites… Pref Set?”. Display Intranet Sites… Pref Set? Yes: Go to “Is the site in the Intranet Zone?”. No: Go to “Domain on MS-Maintained List?”. Is the Site in Intranet Zone? No: Go to “Framed by Compatibility Mode page?”. Framed by Compatibility Mode page? No: Go to “Compatibility Mode Button Pressed?”. No: Go to “Quirky or No Doctype? (IE8)”. No: Go to “Almost Standards Doctype?”. Yes: Use IE8 Almost Standards. The steps are available as a flowchart in PDF and PNG formats. Thanks to Simon Pieters, Lachlan Hunt and Anne van Kesteren for their help with correcting the mode table for various Opera versions and for their comments. 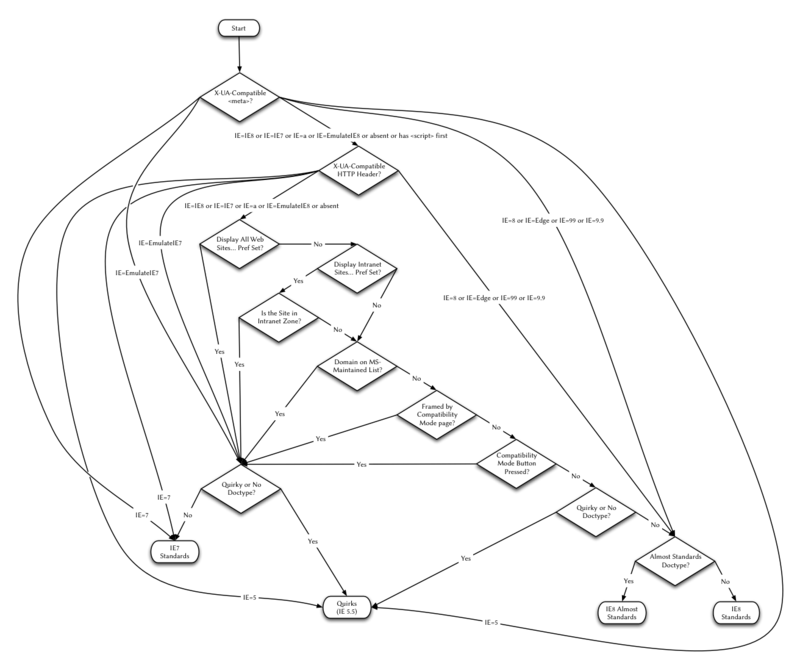 Thanks to Simon Pieters for the text alternative for the IE8 flowchart.